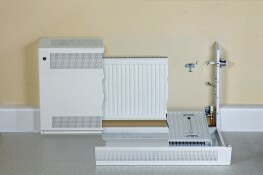 Contour Heating Products Ltd > News > Are LST Radiators Required In Doctor's Surgeries? Despite their sometimes-unappealing aesthetics, medically, doctor’s surgeries should be one of the safest places that you can be. After all, you’re surrounded by training medics! Contour has been blogging this week about how GP surgeries can be made even safer with the inclusion of LST radiators in waiting rooms and consultation spaces. ﻿What Does The Law Say? Doctor’s surgeries are not explicitly required to use LST radiators by law. However, there are NHS guidelines that make recommendations for the maximum temperature that hot surfaces reach for doctor’s surgeries. This includes hospitals, residential care homes and mental health wards. This acts as an advisory for heating experts as they provide low surface temperature solutions. The most effective way to maintain compliance is installing LST radiators to protect against any risk of burns or scalds. Why Are LSTs Important In Doctor’s Surgeries? Doctor’s surgeries are busy places. They often facilitate more than just General Practitioners offering consultations. They can also host antenatal classes or children’s health clinics, as well many other activities such as becoming polling stations. As a result of this, surgeries are often full of elderly people, young children or vulnerable people who could be more susceptible to injury from a hot surface. This is where LSTs becoming a valuable addition to a space. To relax young children, doctor’s surgeries often have small play areas for children to be distracted while they wait to be seen. As they move around it’s important that they are safe from injuries such as burns. LST radiators help to protect against this. For older people, this is also important. As we get older our bodies take longer to recover from injuries and, while any injury is distressing at any age, as an elderly person it can be even more distressing to be recovering from as it takes longer. Contour LST radiators help to protect everybody in a space from the risk of burns from hot surfaces creating a more harmonious environment for all. While LST radiators aren’t a legal requirement in doctor’s surgeries, they are a valuable asset throughout waiting rooms, clinics and consultation spaces as they provide high levels of protection against scalds and burns if a service user or staff member made contact with the surface. Contour Heating offer a number of additional features with our LST Radiators to provide further reassurance that your healthcare facilities are fully optimised for health and safety.